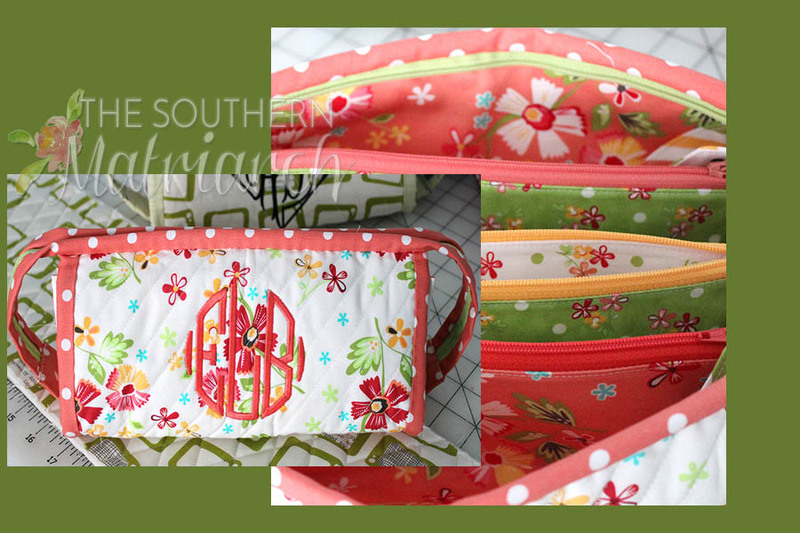 Have you heard of the Sew Together Bag by Sew Demented? If you haven't, you may be the only person. A friend from my SAGA chapter brought one to a gathering our chapter hosted last summer. We were crazy about it. 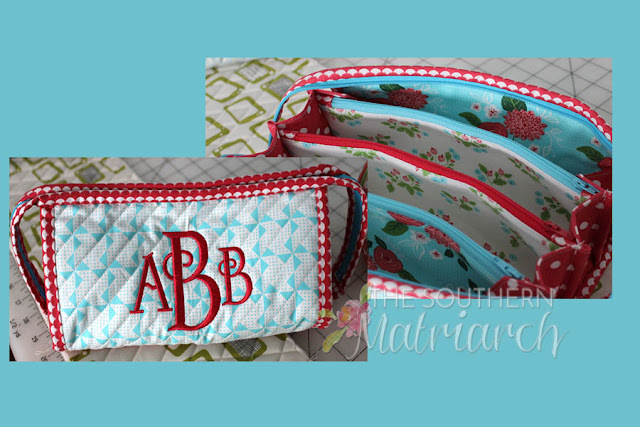 Then another member made one for herself and her daughter. The crazy was on! A group of friends got together and the member who had made one for herself and her daughter agreed to "lead" the rest of us in a sew along to make one for ourselves. Little did we know what a slippery slope this would be. 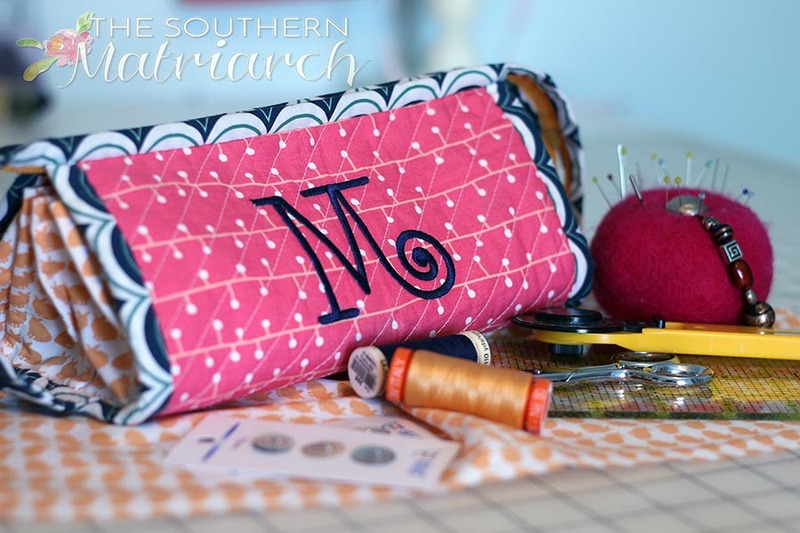 You have to have fabrics for this cute scrappy looking bag. The scrappier, the better. That took a few of us to one of our local quilt shops, Janie Lou Quilt Shop. They were only too willing to feed our obsession, show us the ones they had made. Don't you love those bunnies? You know the problem with a cute quilt shop? All those dang fat quarter bundles wrapped with ribbon with a cute hang tag. 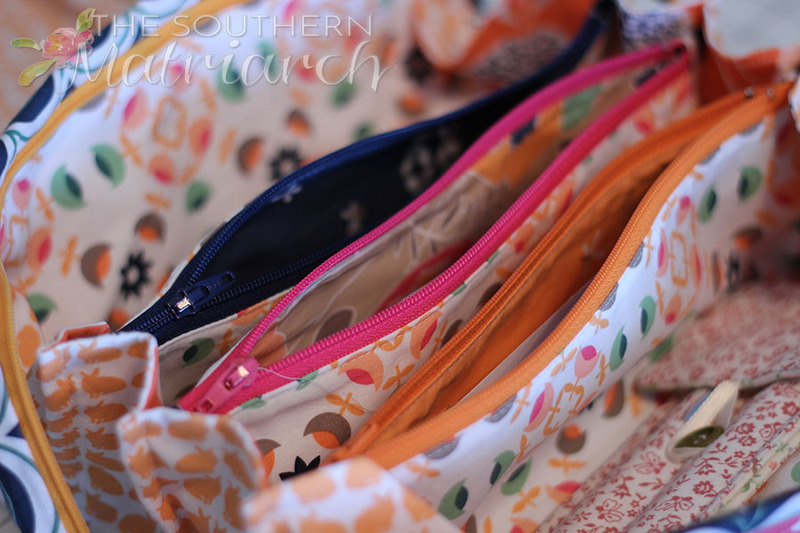 Cute, fresh, modern fabrics in on trend color combinations. All there together for the taking. (Well pay first, it will work out better for you.) All the colors, patterns and designs just calling your name. I bought so da** many its not funny a few. I slapped myself silly when I found myself picking up a Christmas bundle. NOBODY NEEDS A CHRISTMAS bag!! NOBODY! 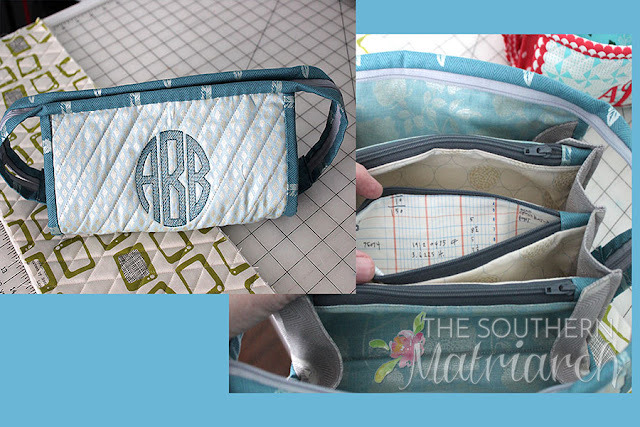 As you can see inside each pocket is a different fabric. Orange and Navy aren't normally colors I would be drawn to, but that pink stripes and the bunnies just wouldn't be ignored. SO I bought the whole bundle. Of course I did! After the cute fat quarter bundle, you need zippers. 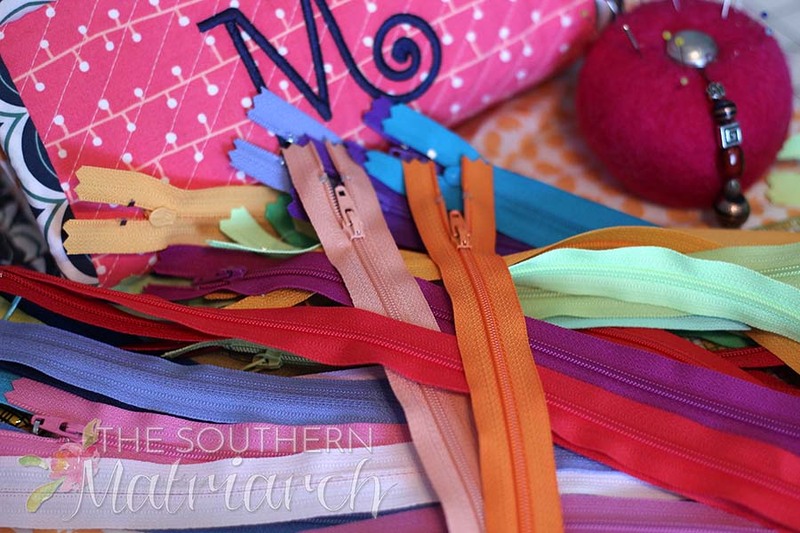 Oh you need so many cute colored zippers. Not those plain ones in boring colors from the big box store, J*'s or H*L*, no you need cute electric colors! And why buy ONE when you can buy two dozen? WHY? 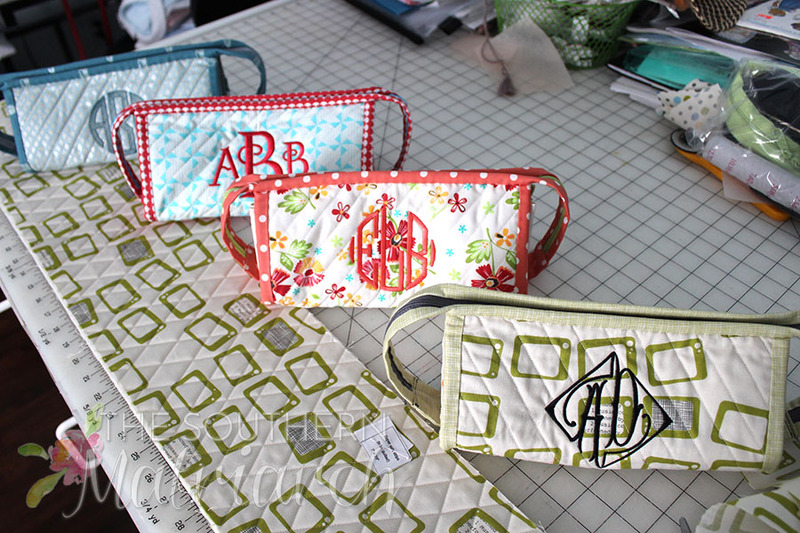 There is a GREAT seller on Etsy called Zipit. Stupendous service and so quick. Ordered on Tuesday, had by Thursday. And has a large assortment of colors in just as many lengths. Truly the zippers come out to well under $1/each. I can justify with the best of 'em. I loved my bag, monogrammed of course. It was so quick, done in an evening and a little bit. No time at all. And fun! Well there my downfall began. "I could make these for the girls!" I said; "It won't take but a minute", I said. And so I did. 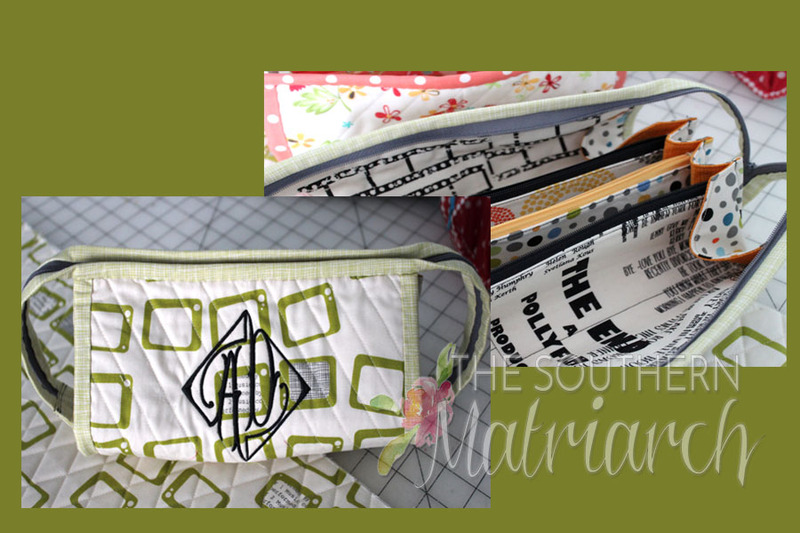 Even more of those cute FQ bundles jumped into my bag and more of my $$ jumped right out. For the theater/stage manager/tv and movie lover daughter. For my go getter, stylin' daughter. For my sophisticated style, accountant, daughter in law. Note the account ledger fabric in one of the pockets. For my don't go too loud, tailored style daughter. Well no I wasn't! I went to Sewing at the Beach in January and needed to take girlfriend gifts with me. Soon four more bundles jumped into my bag. And more $ jumped out. (Are you noting a trend here?) This photo was taken at night with my camera phone, excuse the poor photo and no, there are no photos of the insides. I needed to pack the night before I left. 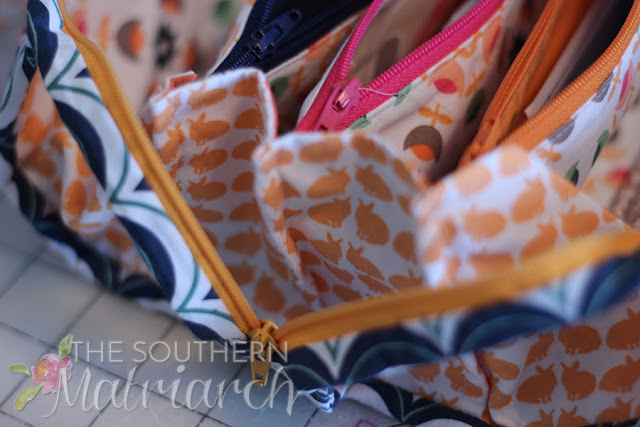 So it began with ONE Sew Together Bag and then there were NINE! I can put those zippers in in my sleep. No two are alike, and that is the fun of it. There are some great blogs out there with step by step photo instructions for making the bag. The best one is by Quilt Barn. Check it out. Have fun faithful reader and I apologize now to your wallet. So cute!! You amaze me how much you accomplish! Love the mind-view of the Fat Quarter Bundles jumping into your bag. love how the fat quarters were jumping in the bag for you - they picked you - you adopted - no way you couldn't resist. 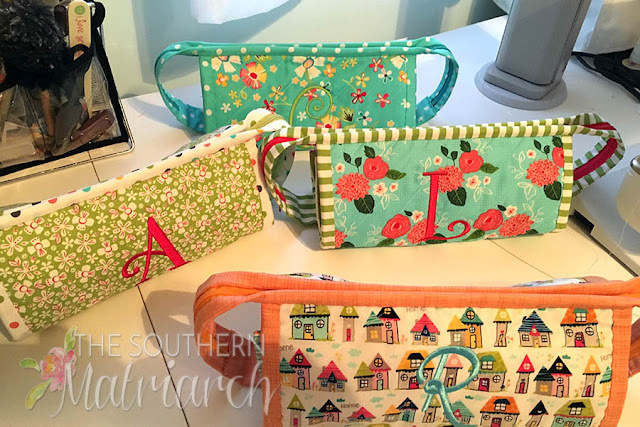 great idea, gets us out of our comfort zone, into a different arena of sewing that offers the mind relaxation from the very detailed, precision sewing that we love to do, and supports our local quilting fabric shops which is wonderful thing to do. most of all love the fun post and the gifts of love that were made in these bags. I love, love those bags. What great gifts. Thank you so much for sharing. Oh yeah! Feed the fabric beastie! You know I love these! !